Yesterday was an exciting day. 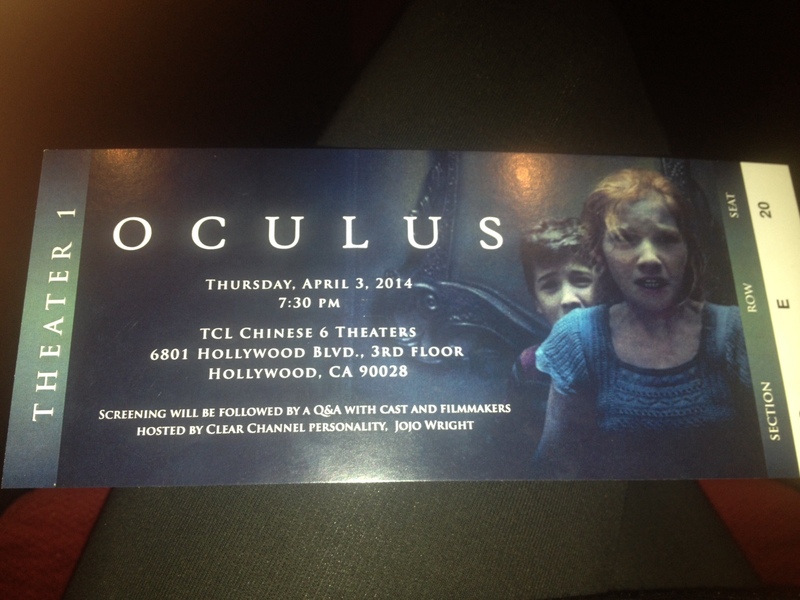 I was invited to go to the screening of the movie OCULUS by on of my friends. She was on the guest list (work related) and could bring an additional person. The screening took place in the TCL Chinese Theatre on Hollywood Boulevard and was hosted by the KISS radio station. I have only seen the theater from the outside, when doing my little walking tour in Hollywood, so it was great to take a look from the inside as well. In addition this was my first screening ever. In Germany previews of movies always happen in Berlin, which is about a 5 hour drive away from my home town and getting tickets is quite hard. OCULUS is a horror movie directed by Mike Flanagan, who partnered with Jason Bloom, who has been involved in Paranormal Activity and Insidious. I haven’t seen a horror movie in a while and especially not in the movie theaters, so it was interesting to see how scared you can get 😉 The movie was quite good, especially for a horror movie, which for me is a genre so overdone. Most horror movies deal with similar story lines and there is nothing new anymore. OCULUS picked up on some of the horror movie cliches as well, like big houses with way too many doors, dogs being aware of the super normal before we humans are, some evil trying to possess people and most essentially mirrors in this case. But overall they had some good scary moments. The beginning of the movie was better than the end, as it was somewhat confusing and kept switching to often between the past and present. But overall I could recommend watching the movie if you are into that genre. Really nice was the question and answer with the cast and crew after the movie. It was interesting to hear the actors view of how it is to produce a horror movie. And I really liked the entire idea of the movie, that mirrors are not flawless and show us something else than reality does. Because I believe this is somewhat true. Haven’t we all been shopping thinking we look good in the shirt or jeans and then went home to try it on again, thinking why we bought this piece. Of course light plays an essential role here.